I only wish you could see this shawl in person, feel its gentle touch, revel in its vintage appearance and have it caress your shoulders. The lace pattern, which reminds me of flower petals or leaves, sway gently this way and that way, making my head spin in delight. 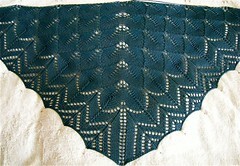 The border has more “open” feel because of the many yarn overs. A welcome change of aesthetics after the more “closed” feeling of the swaying flower or petals section. Oh my lordy, what beauty. I want to cry. 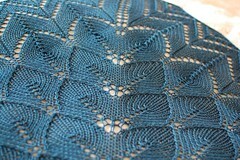 And yet again, the yarn Venezia worsted by the wonderful and affordable brand Cascade, does not disappoint. I have only good things to say about it as you know by now! No time to rest on my laurels, but onward to the next project! 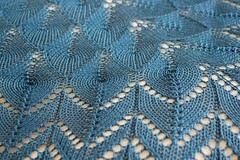 I am using two balls of Merino/Silk Lace by the brand Karabella and two balls of Kidsilk Haze by the brand Rowan. 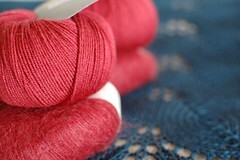 These two lace weight yarns are going to be knit double stranded into a luscious feather and fan scarf. I have made this scarf with slight variation on the Feather and Fan pattern before, but now I am ready to write it out and put it in pdf file for you. It will have a vintage feel to it… I love everything vintage! This entry was posted on Sunday, March 28th, 2010 at 2:49 pm and is filed under Knitting. You can follow any responses to this entry through the RSS 2.0 feed. Both comments and pings are currently closed. Wow! This one is drop dead gorgeous. Very striking. I’m anxious to see what you’re doing in feather and fan. Keep knitting. You just get better and better. You are on a lace roll! Gorgeous. Oh, fabulous. You’re right, the Venezia is just perfect. I love the boldness of the color and design. You never cease to amaze me! Very beautiful piece. 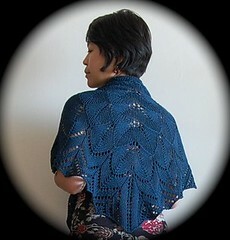 Can’t wait for your feather and fan pattern for the shawl so that I may start my own.